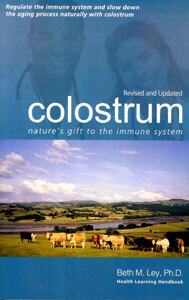 Scientific evidence now verifies what nature has long known - that colostrum & lactoferrin Activate, Regulate, Balance the Immune System! The immune system is responsible to protect every aspect of our health. Colostrum, also known as mother’s first milk, and it’s primary immune supporting protein, lactoferrin, support optimal immunity and health. Learn about the significance of the oral cavity delivery for both the newborn and the adult and how to select the best product to fit your needs! Find out how these important substances can help regain and maintain good health. Evidence shows these powerful immune regulators and enhancers can help fight: Colds & flu, HIV, Asthma, Allergies, Cancer, Diabetes, Periodontal disease, Diarrhea, Lupus, M.S., Elevated cholesterol, Ulcers, Inflammatory bowel & other G.I. problems. The book also features a special product section guide to help you select a quality colostrum lactoferrin product and help you sort through common misleading advertising claims.